The Hamilton Beach Company has been around for many years and they supply a lot of different home appliances. They truly excel when it comes to their coffee makers and the reason for this is the amount of time and effort they put into making these coffee makers great. 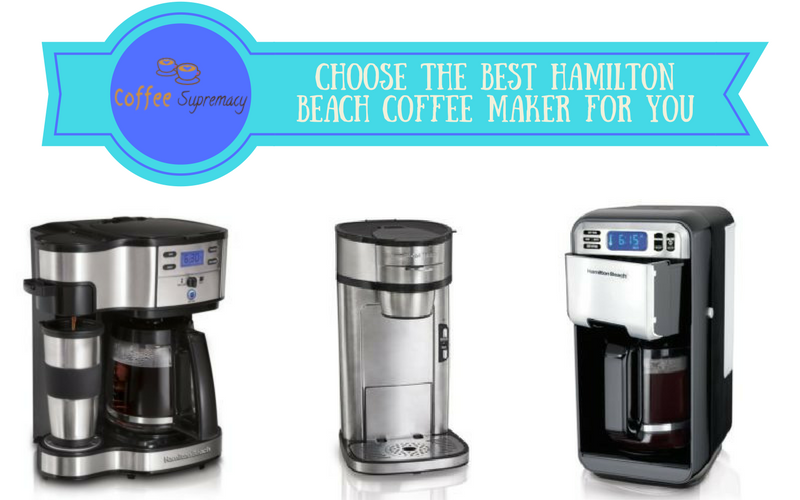 You will be able to choose a few different Hamilton Beach coffee makers of different qualities, options and prices. The more expensive coffee makers will allow you the added benefit of making those fast one cups of coffee when you are in a rush. All the most popular models and their advantages and disadvantages as well as our tips what a coffee maker to buy you can found in our reviews. 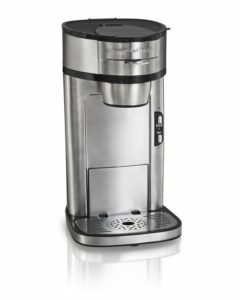 First off, we have the stylish looking 49980A Single Serve Coffee Brewer. This coffee maker does not only look stylish, but it is packed with a multitude of stunning feature to make your life easier and to save you time. The coffee maker has two main features that will allow you to make one single serving of coffee or you could fill up the jug for the whole family and you will have coffee for the rest of the day. The jug will make up to 12 cups of coffee. The brew strength selector should be a great addition to coffee lover’s homes. You will be able to choose between regular and bold, depending on your flavor preferences and this will also be great for that quick fix and bursts of energy in the morning. Likewise, the bold feature can also be used as a nightcap or to simulate an espresso for your guests. 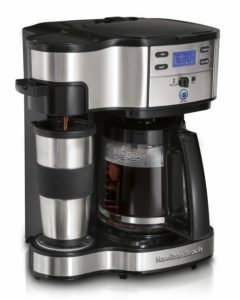 The Hamilton Beach 12-cup coffee maker is perfectly priced and very affordable for the average family and it is still packed with a lot of the more advanced features that you would expect in some of the more expensive coffee makers. The coffee maker will allow you to brew up to 12 cups of coffee for the whole family, while simultaneously allowing you to dispense one fresh cup of coffee if no one else is drinking coffee. Furthermore, there are a lot of features that could be taken advantage of and one of the first one that we think will be great for children is the ability to make iced coffee. Another r great advantage beside the price is the fact that you need not invest in a carafe. These things can become expensive and sometimes they tend to break over time or if someone accidentally knocks the coffee maker they might plunge to the floor. This will save you another few buck on this already cheap coffee maker. Finally, we believe that you will be able to enjoy your favorite cup of coffee without any hassles and the fact that there are no hotplates involved, will ensure that you can have a great tasting cup of coffee without any burning after taste. 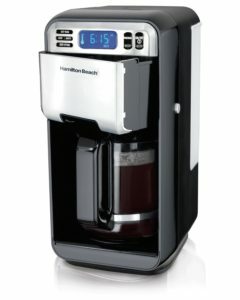 If you are looking for a more stylish looking coffee maker that will entice everyone to ask for a cup, the Hamilton Flex Brew 49983A single serve coffee maker should be perfect for you. The coffee maker once again allows you to choose between the single serving feature and the full pot that can brew up to 12 cups of coffee at one time. You will also be able to add your single serving coffee to the coffee maker if you should grow tired of the coffee beans, but the coffee beans will keep on coming out perfect every time and we believe there will be no need for changing. The lack of a hotplate will make it easy to brew to of the line coffee beans without having to worry about the coffee getting burnt or the flavor changing. Furthermore, the coffee maker comes with an included travel mug that can be quickly filled and taken to work or on the train in those cold winter mornings after a tough party. The coffee maker will dispense single servings of coffee in under one minute and this will save you time and you will also be able to program the coffee maker to brew coffee at a certain time. 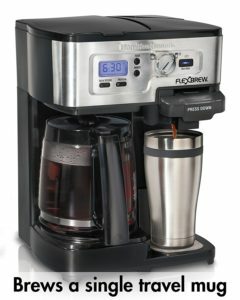 The Hamilton Beach 12-cup Digital coffee maker is great for efficiency and to provide multiple cups of coffee at once. The coffee maker is able to brew up to 12 cups of coffee at any given time and this will be great for the whole family in the mornings. Should you be one of those people that love to steal the extra few minutes for a quick nap before you have to get up, you will be able to program the coffee make to dispense coffee at the time that you need to wake up. This means no more waiting for coffee and a fast and effective way to get you up and energized in the morning. As we get into some of the single serve coffee makers, you will notice that they are not as multi-functional as the bigger, more expensive coffee makers, but they still have the ability to quickly and efficiently brew you coffee without hindering the taste with a burning smell. The Hamilton Beach 49981A Single Serve Scoop coffee makes does not only have a building stand for your cups, but it also features a durable stainless steel frame that has been tested to be impact resistant, should it accidentally be knocked off to the ground. The coffeemaker has the capabilities of brewing up to 14 ounces of coffee with each serving and this could be enough to fill two smaller cups or a larger travel mud to keep you warm throughout those early winter mornings. Furthermore, the filter has been specially designed to allow the perfect amount of coffee to seep through and provide you with a great regular cup of coffee. Finally, we have one of the top coffee makers for the germophobes. 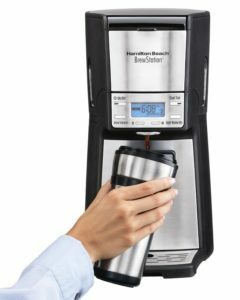 The Hamilton programmable brew station is great for anyone looking to have a nice clean cup of coffee and with almost every part able to simply slide loose, you will have the ability to clean them all. All of the part that can be dislodged are BPA free and you should have a perfectly brewed cup of coffee. The coffee maker can make up to 12-cups of coffee and will also give you a multitude of different brewing options to choose from. You will be able to choose to make iced coffe for the children, while that nice bold cup of coffee will be great for those long and tiring days at the office and the early mornings. The coffee maker will fill up once large mug or two smaller cups and the water level indicator will notify you when it is running low. All of the parts on the coffee maker are dishwasher friendly and you will be able to wash them on a regular basis. 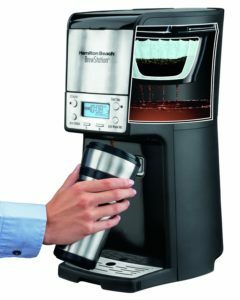 We would like to thank you for reading this article and we believe that you now have the knowledge to make an informed choice on you next coffee maker. We would also like to encourage you to let us know if you have any questions and we will help you get that perfect cup coffee that will lighten and brighten up your day. Previous story Difference between the Keurig K55 and K200 – Which model is better for you?